Well, the first classes of the new semester have begun, but Orin and I have been here for about a month already. So far, we’ve had great experiences of all kinds. We’ve made new friends, tried new delicious food, and started teaching at Joy. It’s hard to describe everything, so I will use pictures to show you some of our experiences. We met Trish and Paul before they left. We didn’t know them for very long, but we will miss them! 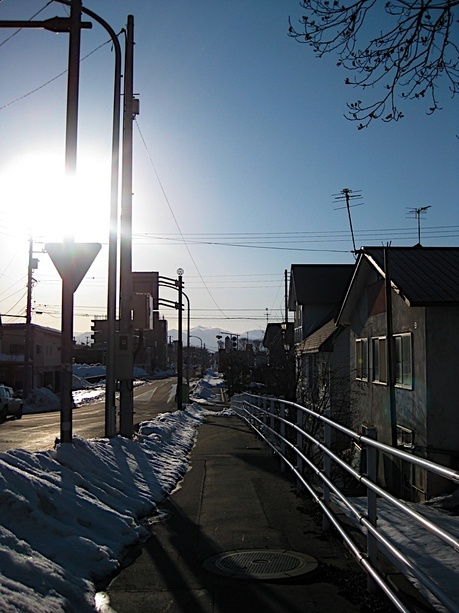 This is my first impression of Obihiro – beautiful! This is an example of some English that makes no sense! “Fuzzy & Inverter” was written on our heater during our stay in C Building. What does it mean?? Not only is it grammatically incorrect, those words together just don’t make sense. What do you think? Well, I think my work at Joy is off to a great start. Please say hi to me if you see me around – I am looking forward to making new friends. Hi, Kendra. Thank you for good pictures, one of which reminds me of Trish and Paul. I think you could easily find a lot of wrong and weird English words in Japan. For example, “Well come” instead of welcome, and “Riquor” instead of liquor. I’ve noticed a beautiful illustration at the top of this blog shows Seattle. I recognized the Space Needle, which appeared in a movie “Austin Powers”. Snow-capped Mt. Rainier, bustling Public Market Center, a ferry on Elliott Bay. Where is Ichiro? Ciao!